If you, like many others, had been excited about Maari after watching its trailer, be prepared for disappointment. Almost all the best bits from the film are already in the trailer and the film clearly lacks the crackling energy that we see in the trailer. Maari largely feels like one huge build-up without any proper pay-off. The story is set in a slum, where Maari (Dhanush, infusing the character with life), a small-time thug, whose heart is in pigeon racing. His rival is Bird Ravi (Mime Gopi), who has been completely overshadowed by Maari, who has become the go-to guy for a bigger don, Velu Annan (Shanmugarajan). Enter a new inspector, Arjun Kumar (Vijay Yesudas, making his debut), who is determined to crack an age-old murder that happens to be the one which gave Maari his fearsome reputation. We also get a sub-plot involving red sanders, probably to make this story seem topical. Perhaps, after Vaaya Moodi Pesavum, which was a half-silent movie, Balaji Mohan wanted to do something relatively simple and chose this script, which has its fair share of cliches. 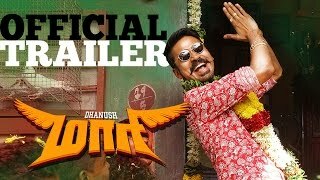 The director seems to be aware of this and he tries to keep things light and never lets scenes get overtly dramatic (in this, he is helped to a great extent by Robo Shankar, who is terrific as Maari's comic sidekick Sanikizhamai), but this approach doesn't suit this material, which is essentially a fawning-over-the-hero masala movie. Plot developments are treated a bit too casually — including the hero being sent to prison — that we are hardly invested in the proceedings. And to make things worse, after doing everything — stylish beard, coolers, trendy shirts to punch dialogue (Senjuduven) and devil-may-care swagger — project his hero, the director fails to provide him with strong adversaries. A hero is only as good as his villain, and the villains here are hardly intimidating. Both Vijay Yesudas (playing a character that is this film's equivalent of Virgil Sollozzo in The Godfather) and Mime Gopi are lightweights in underwritten roles, and never for a moment do we see them as a real threat to the hero. But, Maari is no Anjaan (another recent film that had a star playing a don but fizzled out after building up its hero), though, at times, it does come dangerously close. There are some quirky touches that suggest some spark, though they are definitely not enough for the film to catch fire. The best scene — Maari reclaiming his turf — is pure masala movie moment, and a nice update on the scene in Baasha where every don comes and kisses Rajinikanth's hand. The villain's henchmen arrive at the market to collect the dues from the shopkeepers and Maari, who is unperturbed by them, coolly sits with feet up on a table and throws crackers around, making them jittery. And realizing who is in charge, one by one, the people of the place come and place their money on Maari's table. It is a quietly punchy scene and what the film needed is more scenes such as this one. But what we get are scenes that promise us something impactful but end up as underwhelming. Take the scene where Bird Ravi is left to lick his wounds after Maari refuses to pay him any due. We think he is going to plan something big to cut down Maari to size but instead, all we get is him whining to Arjun. Even the romantic track isn't lazily done, though it does follow the Tamil cinema template of an educated, pretty girl falling for a crude but goodhearted ruffian. Just as we roll our eyes when Sridevi (Kajal) begins to woo Maari after he helps her out in a financial transaction, Balaji Mohan introduces a twist into this and we are surprised. If only had he done such things throughout the film, we would have got the quirky mass masala movie that we were promised in the trailer.